Do you love your garden birds? They bring cheer all year. 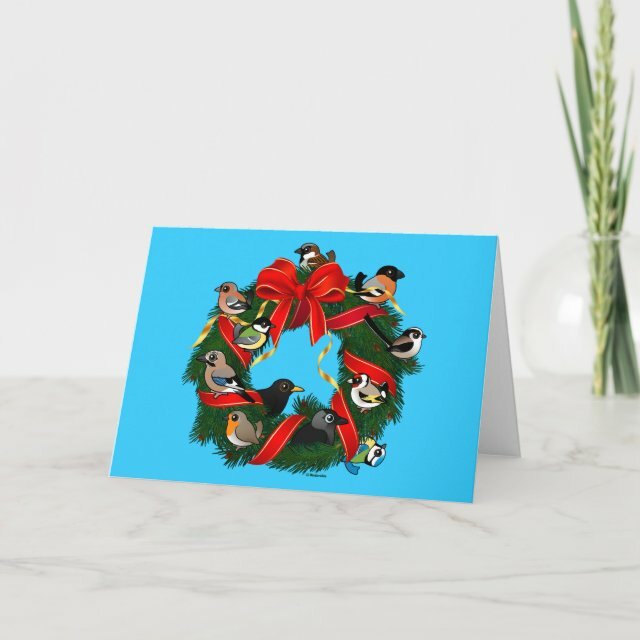 In this original cute design, they're bringing cheer for the holidays! Common and widespread European songbirds perch on a green wreath for Christmas. The wreath is also decorated with a large red bow and pretty gold ribbon. You can customize this gift! Move the wreath around, change the background color or style, add text or images -- make it your own! Dimensions: 5" x 7" (portrait); 7" x 5" (landscape). Full color CMYK print process. Double sided printing for no additional cost. Paper Type: Matte. A classic, all around paper with a natural feel and an more... uncoated matte finish; our Standard Matte stands the test of time. Elegant and understated, colors print softer and more subtle.